When a doctor tells you to "take two of these and call me in the morning," he truly means two - not three, not one - and to get back to him the next day, not later in the week or the following month. Yet physicians, pharmacists and researchers have been frustrated for decades at patients' inability to follow such simple instructions and remain on their medication regimens. 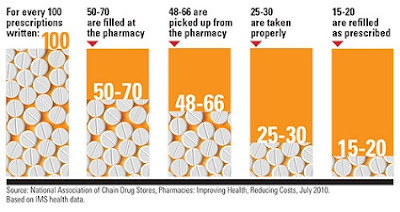 Twenty to 30 percent of prescriptions are never filled, according to research published in the journal Annals of Internal Medicine, and half of all people do not follow their drug instructions, even when that is critical to keeping them alive. The reasons for medication non-adherence, as it is known, are many: For the poor, it is often cost; for some elderly people, it is confusion over the 14 or more prescriptions they receive each year, according to a report from the Food and Drug Administration. Others say they have trouble understanding what their doctors want them to do. But even understanding all that, "the amount of non-adherence is staggering," said Meena Viswanathan, director of the RTI-UNC Evidence-based Practice Center, a public-private institute that analyzes health care and health policy. As much as $289 billion is spent annually on needless hospitalizations, emergency room visits and other costs for people who don't follow their drug regimens, research shows. One study, now 30 years old, attributed 125,000 deaths annually to non-compliance - about the same number of people who die each year from strokes. Publisher Comment: In addition to making sure PBMs and TPAs aren't hiding cash flows, payers must measure outcomes based upon every healthcare dollar spent. One metric, patient medication adherence, is oft-ignored. Would you hire 1,000 people and provide them with no leadership? In other words, you tell these new hires to grow revenue by 30% and the only tool offered is an employee handbook. Just as employees require a roadmap to success so do people taking multiple prescription medications. When properly prescribed and administered, prescription drugs are a cost offset opportunity. A wide variety of attempted solutions - including free medicine - haven't helped much. But with the Obama administration keen to control medical costs and improve the quality of health care, a round of experiments funded by the Affordable Care Act is winding to a close. All three were part of the $1 billion in "health care innovation awards" handed out in 2012 under the new law. Other efforts, by public and private sector groups, are ongoing. 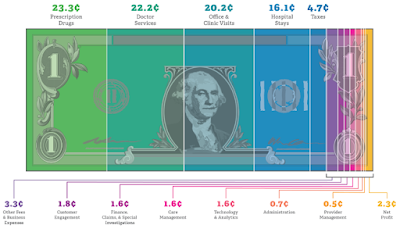 One project applies behavioral economics to the problem. Researchers at the University of Pennsylvania gave 1,000 people "electronic pill bottles" when they left the hospital after heart attacks. If they forgot to take their medicine, the cap would light up and beep. If they didn't comply for a few more days, a designated friend or relative, as well as their doctor, were notified. David Asch, director of the Center for Health Care Innovation at the university's medical school, said full results are not yet in, but preliminary data from the study suggest a big improvement in adherence when compared with other efforts involving similar patient populations. "We designed it with the foibles of human nature in mind, not with the rational person in mind," he said. "Because the rational person would have been taking their meds in the first place." 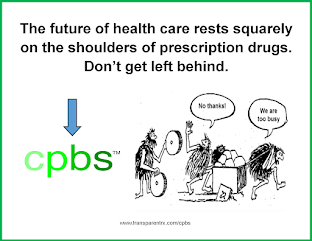 In Hawaii, another project, the $14.3 million "Pharm2Pharm" experiment, seeks to connect doctors and pharmacists who dispense medication to patients leaving hospitals with community pharmacists who will continue giving out those medications as those people resume their daily routines. Community pharmacists often complain that they have no idea which medications their patients are taking, especially when they leave hospitals with new ones and can't guard against dangerous interactions. In Wisconsin, more than 25 percent of the state's pharmacists took a 12-hour training course, then sought out 100,000 people who appeared to be failing to refill their prescriptions or taking incorrect drugs based on data provided by insurers under a $4.1 million project run by the state's Pharmacy Society. Most were poor or elderly. After working with the patients, the pharmacists relayed their findings to prescribers. "Cost is a factor, convenience is a factor," said Chris Decker, the organization's chief executive officer. "Lack of recognition of importance or need, health literacy and understanding" all contribute to non-adherence, as well, he said.